Measures: 14ga (1.6 mm), top ball 5 mm, bottom ball 8 mm, 3/8 in (10 mm) shaft . 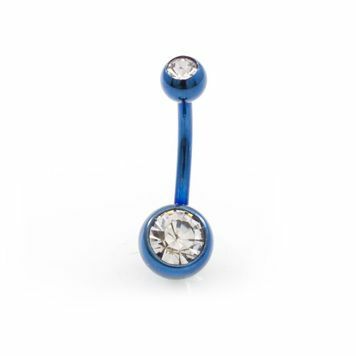 These belly rings have an anodized titanium finish for long-lasting color and durability, made of the highest quality surgical steel. In this amazing value package you will receive a pack of 10 belly rings in an assortment of colors in which none are repeated.